Once green pepper, onion, and jalapeno are diced place in bowl and set aside. (I used a food processor to speed things up and so it was diced finely because as I mentioned I'm cooking for a picky eater who isn't a fan of vegetables.) Place Diced Chicken in separate bowl and add cumin, chili powder, onion powder, and garlic. Stir and toss until seasoning is evenly distributed. Heat oil in large pot on medium-high heat. Add chicken and saute for a few minutes, stir so all sides of chicken cook and start turning white. Once chicken is cooked, add diced green peppers, onions, can of diced tomatoes with green chilies with its liquid, garlic, and can of tomato paste. Stir then saute for a few minutes. Turn heat on low and add chicken broth, frozen corn, and rice (if ready) then stir until ingredients are well mixed. If rice is not ready, just stir and cover soup until rice is ready. Finish by serving in a bowl and garnishing with cotija cheese. Cotija can be difficult to find or you can subsitute it with feta cheese. I also like to add chips or baked flour tortillas. 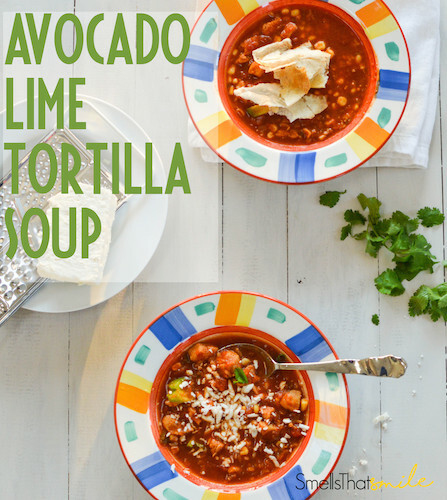 You can also garnish with your other favorite toppings like sour cream or beans! Heat oil in stockpot at medium-high heat; add seasoned diced chicken and sauté until all sides start to get white on all sides (for about 4 minutes). Stirring occasionally so meat gets cooked on all sides. Turn heat on low. Stir in chicken broth and frozen corn. Stir making sure the tomato paste is evenly mixed in to broth. Cover stirring occasionally. Once your rice is cooked, stir into soup. If your rice was premade or ready, add it with corn and broth. Stir until rice is well distributed. Add diced avocado, cilantro, and juice from one lime. Cover stirring occasionally for about 15 minutes. Serve and garnish with cotija cheese and baked tortilla.